BPT suffered an awakening last weekend with the distribution announcement. Fair value of the units is approximately $8.10. Unfortunately, the trust could remain overvalued for some time. Last November, I wrote a rather bearish piece on BP Prudhoe Bay Trust (BPT). Since then, I noticed several things. First, the short has become crowded. Second, the oil price went up while the trust trades a bit closer to fair value. Third, investors strongly respond to distribution announcements. To complete the update, I can add that it is still on Greenblatt’s Magic Formula screen, and that I still believe BPT to be a value trap. After market close on April 5, the trust announced a Q1 2019 distribution of $0.3449 per unit. On the next trading day, investors decided to send the units almost 14% lower. This is somewhat surprising as, like I said in a comment on this article which correctly predicted a payout of 35 cents: anyone with half a brain, a calculator and maybe a pencil could’ve seen that coming. Even the ability to just read articles on Seeking alpha would do. In my last article on BPT, I argued that using prices of call options was the only right way to value BPT. The reason is that the trust can’t post negative earnings and there are certain WTI price thresholds (that shift up every year) above which BPT makes a rather linear return. Using options with escalating strike prices is then the best option (pun intended) because it captures the chance of increasing distributions while the downside is capped at zero. Another nice feature of this approach is that there is no need to discount anything, option prices represent current NPV. The table below is similar to the one in my last BPT article and shows the components of fair value per unit. Source: author’s own calculations. Option prices sourced from CME group. European-style options were used for the first couple of years because they most accurately reflect exposure, while American style options were used for the later years for price availability and liquidity reasons. The second last column shows the option price multiplied by field production which is set at 77,000 barrels per day. As the table above shows, the fair value of BPT is close $8.11 including the next distribution. The value of the options, like the price of crude, went up since November, so the WTI call option position would’ve made money while BPT decreased in value. Nevertheless, the trust is 190% overvalued at $23.50 and should attract plenty of bears. Over the past months, more short sellers have found a target in BPT than perhaps ever before. Strikingly, short fees reached well over 90% at Interactive Brokers in March. According to data on shortsqueeze.com, only 1.75m shares are sold short, just 8.2% of the 21.4m outstanding. This is a lot, but shouldn’t justify 90%+ fees. The high fees have different causes. For starters, any rational investor can see that this trust is worth a fraction of its market price. This makes the upside so big that short sellers feel they can afford the high cost. And I must admit that paying a high annualized fee of 100% during one or two weeks leading up to a distribution announcement like the one of April looks like a smart choice. The second contributor to the high short fees is the fact that only 5.32% of units are owned by institutions. This is relevant information because it is institutions that commonly lend shares to others investors to sell short. But in this case, the extraordinary high fees are very attractive and retail investors holding these shares should wake up and find out how they can monetize this (some brokers offer possibilities), yet few have. An interesting play for opportunistic institutional investors could be to go long, collect the short fees while buying put options (and possibly selling calls) as protection. I never initiated the arbitrage position as laid out in my previous BPT article. I did, however, sell a call and buy a put option (both for June 2019 with a $22.50 strike) a couple of days after the article was published; a synthetic short. To my slight surprise, the call option got called in March (i.e. my counterparty bought shares from me at $22.50, and I wasn’t long, so I automatically went short), 3 months early. This is uncommon because the time value of options usually makes a 3 months early exercise of options unprofitable unless the option is in deep in the money and a big ex-dividend date is coming up. Because I was short BPT after this event, I changed my plan to hold the short position until after the dividend announcement because I had a daily cost of around 25-30bps, or about 50 cents per share every week. Due to the market reaction following the utterly predictable news of the Q1 distribution, this worked quite well and I covered below the original strike of the option. When will the bears win the war? The market price of the trust units obviously doesn’t incorporate the fundamentals of higher charged production costs. What we have observed is price sensitivity to WTI crude and distribution announcements. 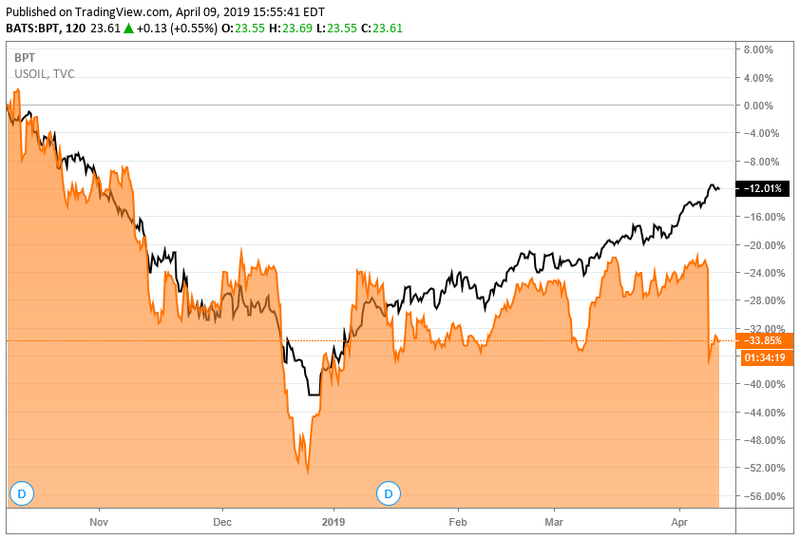 Prices of WTI (black) and BPT (orange) Source: Seeking alpha. Price changes of WTI (black) and BPT (orange) Source: Seeking alpha. 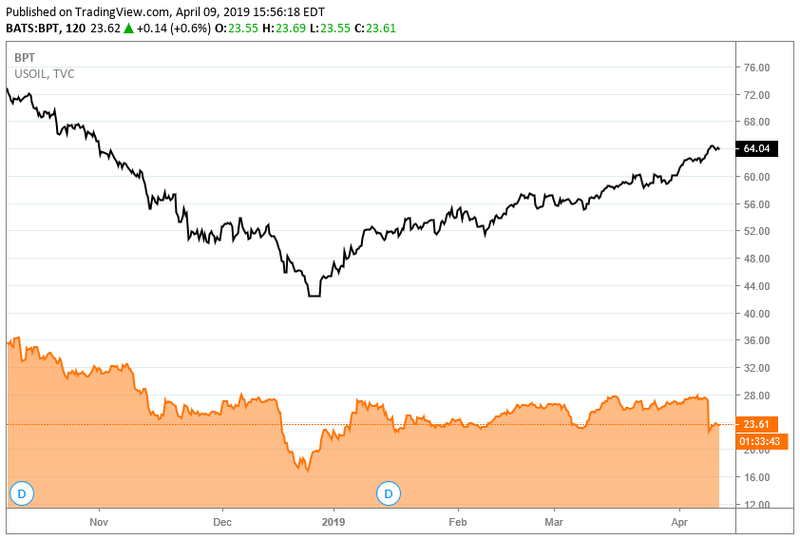 BPT is very much overvalued but investors do appear to look carefully at WTI. So clearly, many shareholders are paying some attention but fail to read-up on fundamentals and therefore are surprised by announcements of lower distributions. Perhaps even more will not notice what is going on until after the distribution is paid. Either way, the interesting question to me is what will happen after the next announcement, that could be double compared to Q1 thanks to the increased WTI. As long as there is some yield, investors will probably overvalue BPT. When the distributions go towards zero the last longs should wake up and perhaps by then the stock could swing to undervaluation. But at this WTI, we would have to wait for that to happen until 2021. That is when bears will have won the war. Meanwhile, I will hold on to my put option in the hope that the market catches up to BPT’s real value, slowly but surely. Disclosure: I am/we are short BPT. I wrote this article myself, and it expresses my own opinions. I am not receiving compensation for it (other than from Seeking Alpha). I have no business relationship with any company whose stock is mentioned in this article.